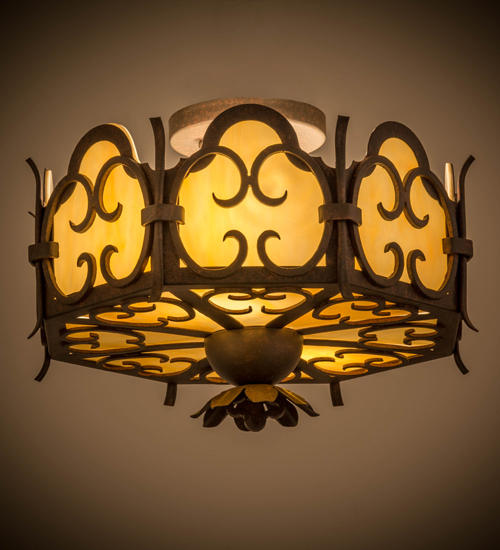 Description: Dramatic elegant scroll designs are highlighted on 8 side panels and the bottom diffuser of this beautiful fixture, which is featured in stunning Beige art glass. The scrolls, decorative accents, floral finial and matching hardware are all featured in an exquisite Cajun Spice finish. Handcrafted in our 180,000 square foot manufacturing facility in Yorkville, New York. This chandelier is available in custom sizes, styles and finishes, as well as dimmable energy efficient lamping options such as LED. UL and cUL listed for damp and dry locations.